Waiting for the Easter holiday ahead? Want to have fun with your loved ones. 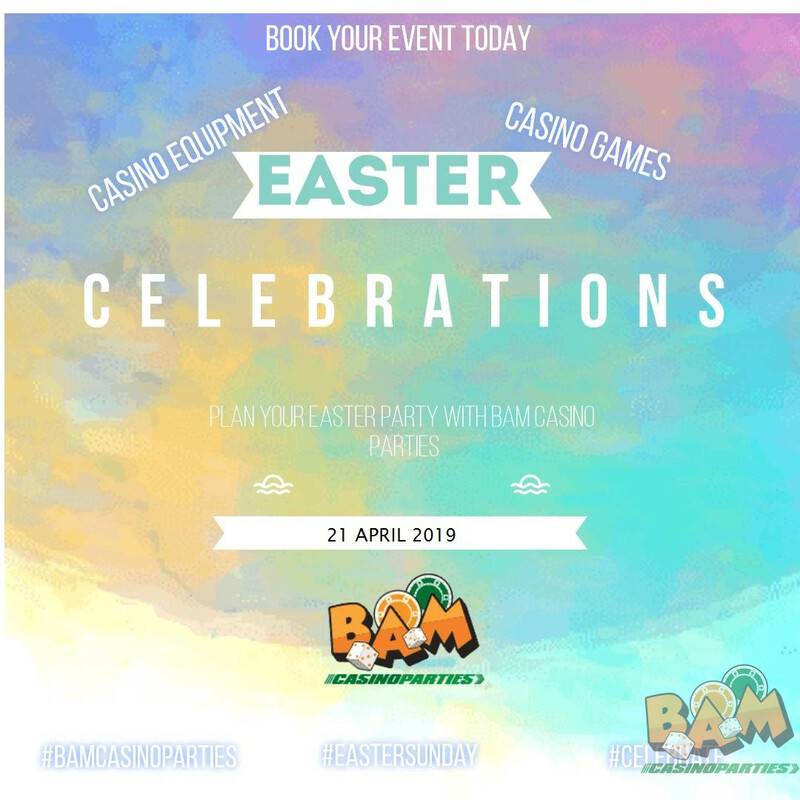 BAM Casino parties perfectly creates a realistic casino atmosphere where your loved ones can enjoy casino events, gaming and lots of thrill in an exciting and dramatic way at your doorsteps while having an awesome experiences. Casino games are known for having the best each time for everyone ranging from the oldest to the youngest-each one can have the best evenings and will love to play. Hey, you all the party freaks out there, get yourselves into the action! It’s Easter and you have another holiday that means you are again up for the party. Hiring a casino is one of the best decisions and genuinely an inexpensive way to create your Easter party memories with all your dear ones, maybe it’s your boss, colleague or friends. With a full size tables, cards, games for hire and the professional dealers here are always ready to teach you how to play at your best. They are the entertainers as well for your party. Our dealers/professionals are chosen keeping in mind the overall entertainment package for you and your guests. This is not only just for their skills at the gaming tables but also for their personality and ability to entertain your guests. They can teach your guests how to play, can teach them few basic strategies used by the gaming professionals, if your guests want to learn but amongst all basically they ensure that everyone at your party HAVE FUN and are enjoying the party. Whether it’s your home or any venue you have selected, we at BAM Casino parties ensure the best ever deals, discounts for you. Easter party comes once a year but we make it for years to remember with our awesome casino night services and chilled party attitude. Be the party animal and enjoy your holiday like there’s no tomorrow. We offer a full size casino gaming tables, (blackjack, roulette, craps, and more) to set an awesome, gun filled event that is perfect for any occasion. Just try being a good host and let your guests enjoy all the party madness. So, yes get your friends raving for your next Easter party you plan and groove up your booties to the beats with all time favorites. If you feel that you have to move all the way to Vegas for enjoying the thrill of gambling, then just think once again. BAM Casino parties is one of the best service that offers rental equipments, games with as much excitement as anything that you may find on your Vegas trip. You can enjoy your casino nights with your bosses, friends, colleagues and with whomever you want it at your desired places. You can go for a house party or any other desired place you find it comfortable. We can travel all the way to your location so that you have the best party ever. What sets us apart from others is our services, professionals and the dealers that perfectly can help anyone to enjoy their evenings with so much fun. Also Read – How To Plan & Host a Casino Night Fundraiser? San Francisco, South San Francisco, Daly City, Colma, San Bruno, San Mateo, Millbrae, Hillsborough, Burlingame, Foster City, Belmont, San Carlos, Atherton, Oakland, Palo Alto, Los Altos, Mountain View, Sunnyvale, Cupertino, Saratoga, Campbell, Los Gatos, Santa Clara, San Jose, Milpitas, Fremont, Newark, Union City, Hayward, Castro Valley, San Lorenzo, San Leandro, Alameda, Emeryville, Berkeley, El Cerrito, Richmond, San Pablo, Hércules, Benicia, Vallejo, Martinez, Concord, Pleasant Hill, Walnut Creek, Lafayette, Orinda, Moraga, Alamo, Danville, San Ramon, Pleasanton, Livermore, Pittsburg, Antioch, Brentwood, Portola Valley, Half Moon Bay, Pacifica, Sausalito, Tiburon, Mill Valley, Corte Madera, Larkspur, San Rafael, San Anselmo, Fairfax, Novato, Petaluma.